Why is it, that when we think of a snack that’s good for us, we automatically think it’s going to taste bad? That’s because in many cases, that is EXACTLY what happens. Health foods are often missing two key ingredients: flavor and satisfaction. So often I find myself wanting for more. While it may technically be good for your body, health food has a bad rap for sometimes leaving your tummy and taste buds suffering. For instance: the other day I picked up two new granola bars from my local health food store. To have them on hand is great for on-the-go snacking, as well as for an afternoon pick-me-up. However (to my dismay) they absolutely screamed health food bar. When I bite into a snack bar, I don’t want to feel like I just ate bird seed with an essence of dirt. I think we’ll leave that for the birds! This weekend, my husband and I camped out in our new tent. 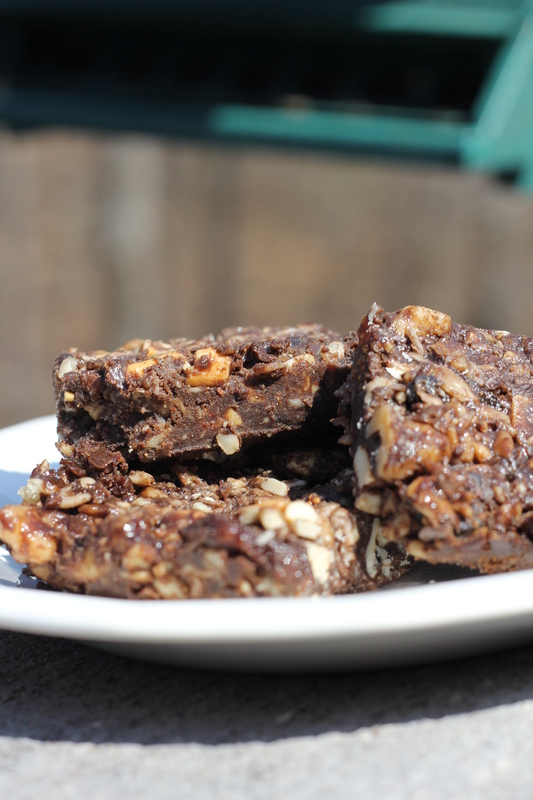 In need of some good fuel, I set out to make a snack bar that’s not only nutritious, but one that we actually want to eat! Thus, the Cocoa Crunch Bar came to be. And let me just say… you will want more. Brett and I were like two little piglets, gobbling up their sweet & salty goodness. We almost felt naughty, like we were chowing down on snicker’s bars. The kicker: we didn’t have to feel a single bit of guilt. It’s all good. Try for yourself! It’s well worth the effort. In a mixing bowl, add all ingredients together except for the Coconut Oil and Almond Butter. Next, melt your Coconut Oil and pour over the mixture. Then, do the same with your Almond Butter. Bake at 300 degrees for about 30 minutes. Put in refrigerator until fully set. Note: if you don’t have figs, dates or prunes on hand, that’s okay! Get creative! You can easily substitute with raisins, dried fruit, etc. You can also use different nuts like pecans or almonds. Do what you like and make them your own!